THE WESTERN Bulldogs have kept their finals hopes alive, overcoming a slow start to beat Carlton by 20 points in a low-scoring scrap at the MCG on Sunday. After the Blues rammed on three goals within the opening 10 minutes of the game, the Bulldogs answered with five consecutive goals of their own to take control of the contest. When Marcus Bontempelli kicked the last of those goals with a brilliant around-the-body snap, the Bulldogs led by 16 points at the eight-minute mark of the second term. After the Blues' opening burst, the Bulldogs held them to just another three goals in the next two-and-a-half quarters to take a comfortable 26-point lead into the final break. Carlton kicked three more goals in the final term, but the Bulldogs were never seriously challenged as they ran out 12.10 (82) to 9.8 (62) winners. Bontempelli (30 possessions, five clearances, two goals and six inside 50s) was outstanding for the Bulldogs, and was ably supported through the midfield by Jack Macrae (31 possessions, eight marks and six tackles) and Caleb Daniel (25 possessions), who was especially influential when the Bulldogs got on top in the second quarter. Luke Dahlhaus (28 possessions) was also a prolific ball-winner, while Jason Johannisen (23 possessions and one goal) showed signs of a return to form after signing a lucrative five-year deal with the Bulldogs earlier in the week. Debutant Lewis Young (21 possessions and nine marks) also made a strong impression in the Dogs' defence with his sure marking. The Bulldogs had won just one of their previous five games leading into Sunday's match and the victory over the Blues was a welcome relief. Bulldogs coach Luke Beveridge said his team had taken a step forward after its recent horror run. "We were a lot better today," Beveridge said. "It's pleasing to keep a team to 40 inside 50s, defensively that's really sound and we had our opportunities. "We probably didn't function, again, inside 50 and kicked some long balls to their talls (key defenders). "Overall we had a lot of winners which was fantastic." The Bulldogs will face sterner tests in the run-in to the finals, with games against Essendon, Greater Western Sydney and Port Adelaide to come in the final six rounds, but Sunday's win brought them within a game of eighth-placed St Kilda. The Dogs' day was soured by a hamstring injury to Jake Stringer that looks set to sideline the mercurial forward for several weeks. Stringer clutched his left hamstring as he ran towards a contest early in the second quarter and did not return. Kade Simpson (23 possessions and seven rebound 50s) provided a cool head in defence, while Liam Jones continued the career renaissance that was rewarded with a new two-year deal earlier on Sunday. Carlton coach Brendon Bolton praised the Bulldogs' pressure after the game but said his team had a down day with its skill and decision-making. "I thought it was a scrappy game. There were a lot of fundamental skills errors, probably from both sides but particularly from us, particularly with some errors forward of centre and decision-making, which we missed with some opportunities to hit the scoreboard," Bolton said. "I thought all of our players at times were a little bit scrappy, that's probably the best way to assess it. "We had moments. I thought we started the game really well, we finished well, we had a crack late, we had some looks, in between it was scrappy." Carlton got off to a fast start, kicking the game's first three goals through Charlie Curnow, Levi Casboult and Blaine Boekhorst. The Blues stretched their lead to 17 points soon after when Jack Silvagni kicked a behind from a set shot. 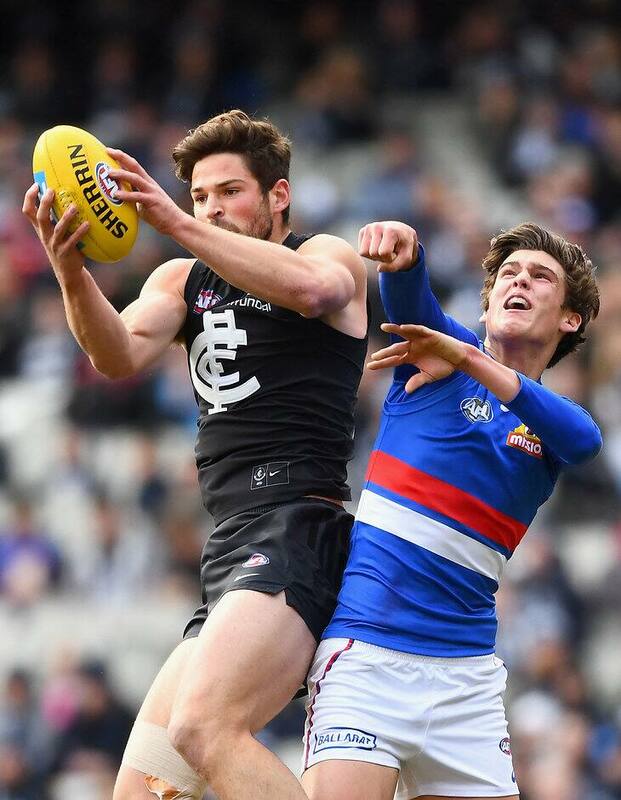 The Bulldogs broke the Blues' run three minutes later, when Carlton defender Jacob Weitering kicked directly into Jack Macrae's outstretched hands as the Bulldog midfielder attempted to smother his kick. Macrae then handballed to Lachie Hunter in the goalsquare and the Bulldogs had their first major. Stringer added another goal for the Bulldogs at the 20-minute mark to help reduce Carlton's lead to four points at the first break. The Dogs carried that momentum into the second term, kicking three unanswered goals in the first eight minutes – through Toby McLean, Mitch Honeychurch and Bontempelli – to jump to a 16-point lead. Bryce Gibbs hit back for the Blues soon after when he marked unattended in the goalsquare, but goals to Bailey Dale and Liam Picken stretched the Bulldogs' lead to 22 points. A Matthew Wright behind at the 27-minute mark reduced Carlton's half-time deficit to 21 points. Carlton: Dale Thomas was a late withdrawal with a soleus strain and could miss another game according to Blues coach Brendon Bolton. "(I'm) not sure if he'll be right for next week. We gave him as much (time) as we could at the end of the week but he's got a strain in his soleus," Bolton said. A Carlton spokesman said Alex Silvagni had suffered a knock to the knee and would be assessed early next week, along with Ciaran Byrne (tight groin) and Dylan Buckley (tight hamstring). Western Bulldogs: Jake Stringer injured his left hamstring in the opening minutes of the second quarter. The forward limped from the ground and applied ice to his hamstring as he sat on the interchange bench. He did not play any further part in the match. Bulldogs coach Luke Beveridge was unsure of the extent of Stringer's injury after the game, saying the forward would undergo scans. The Blues take on the bottom-of-the-ladder Brisbane Lions at the Gabba in a twilight game next Sunday. Carlton has lost its past three games at the Lions' home ground, its last win there coming in round nine, 2013. The Bulldogs host Gold Coast at Cazaly's Stadium in a twilight clash next Saturday, having won all three of the teams' encounters at the Cairns venue.